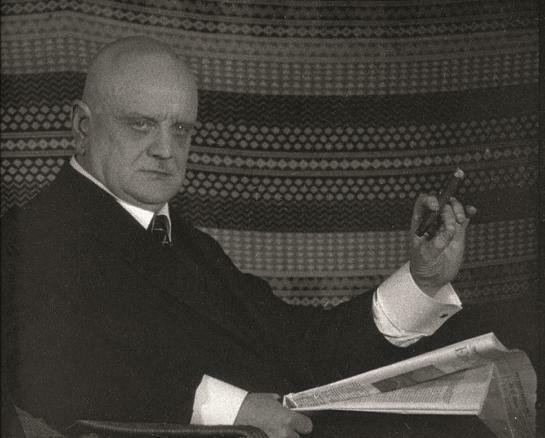 As the master composer disliked being photographed, Jean Sibelius was rarely caught on camera. 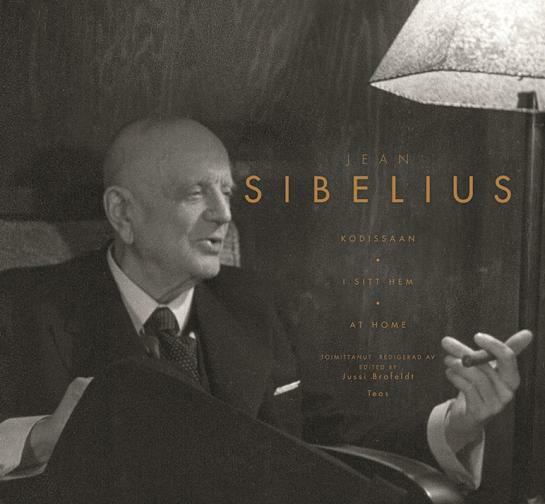 In 1927 and 1945, the film company Aho & Soldan was allowed to shoot a documentary featuring Jean Sibelius at Home. This book contains 50 photographs selected from the films along with expert articles. Säveltäjämestari Jean Sibeliuksesta on hyvin vähän valokuvia. Hän ei pitänyt kuvattavana olemisesta. Vuonna 1927 ja 1945 filmaustoimisto Aho & Soldan pääsi kuvaamaan Jean Sibeliusta kodissaan. Kirjassa on 50 filmeistä poimittua valokuvaa asiantuntija-artikkelien kera. Det finns mycket få fotografier av tonsättarmästaren Jean Sibelius. Han tyckte inte om att stå framför kameran. 1927 och 1945 fick filmbolaget Aho & Soldan lov att filma Jean Sibelius i hans hem. Boken är illustrerad med 50 utvalda bilder ur filmerna och texterna är skrivna av kännare. "Kansainvälisesti maineikkain säveltäjämestarimme Jean Sibelius (1865–1957) tunnetaan tarkkaan valituista valokuvista, joiden sommittelu, ilme ja tunnelma viestivät usein jylhää suuruutta, keskittyneisyyttä, vakavuutta. Kodissaan, myyttisessä Ainolassa, kuvattuna Sibeliuksella oli myös herkempi ja välittömämpi puolensa, minkä Jean Sibelius kodissaan tuo ainutlaatuisella tavalla esiin. Teos esittelee 50 valokuvasta rakentuvan tarinan kautta palasen säveltäjämestarin ja hänen perheensä elämää heidän rakkaassa Ainolassaan. Valokuvat ovat filmaustoimisto AHO & SOLDANin elokuvasta Jean Sibelius kodissaan, joka on kuvattu pääosin vuonna 1927 sekä 1945, Sibeliuksen 80-vuotispäivän kunniaksi. Mukana on myös ennen julkaisemattomia otoksia. Kuvien lisäksi kirja kokoa yhteen seitsemän artikkelia, joissa eri kirjoittajien näkökulma Sibeliukseen avautuu nimenomaan säilyneen dokumenttifilmin kautta. Kaikki tekstit löytyvät teoksesta suomeksi, ruotsiksi ja englanniksi. Erinomainen lahjakirja Jean Sibeliuksen ystäville ympäri maailman". It just happened. Van after van full of furniture stopped at the reed-lined lake in Tuusula where the artists’ families had moved. Juhani Aho and Venny Soldan-Brofeldt, Eero Järnefelt, Pekka Halonen, J. H. Erkko and Jean Sibelius who formed the new artists’ colony, and they all became very important in Finnish artistic life. Creative joy everywhere, and good sense. Now, there is just me, Heikki Aho’s daughter, to relate this true story. 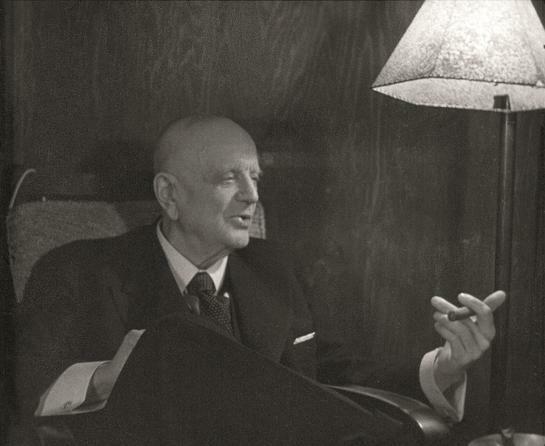 One day in the autumn of 1945, we got into the car with our motion picture cameras and tripods and drove to Ainola, the home of Jean and Aino Sibelius, to film a few scenes with Jean Sibelius for the occasion of his 80th birthday. Most of it took place in the bright and beautifully appointed sitting room where the grand piano also stood. All the window sills had pots with blue African violets. My father persuaded Sibelius to sit down at the grand piano and play a few notes. Each time that I went to Ainola in 1961 to film, I somehow sensed the musical atmosphere that existed there – the greatness that Janne-setä bestowed on his native country. In the living room there was also the grand piano, but it was quite still. No one touched the keys. One might have thought that there would be music at Ainola constantly, but that was not the case. Jean Sibelius’s daughters did take piano lessons, but their father forbade them to practice their études at home. That is why they went over to Ahola and played their scales there. Quite remarkable. There was one time I was very proud when I realized that I could contact Janne-setä to ask for his permission to publish a greeting. It was in 1947, the summer I worked as a volunteer at the Västra Nyland newspaper and had to write about the first song festival in Ekenäs after the war. I suggested to the Editor-in-Chief that we should ask for a greeting from Sibelius that would be printed in a box in the paper – and that is what happened". - Claire Aho (b. 1925) is one of the pioneers of both Finnish photography and of colour photography. She is still busy with several exhibitions, books and film projects. She is the eldest daughter of Heikki Aho, eldest son of Juhani Aho and the painter Venny Soldan-Brofeldt. 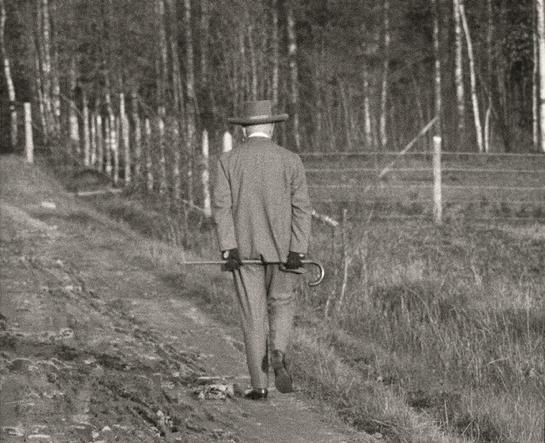 "Jean Sibelius was filmed for the first time in the spring of 1927 at Ainola, his home in the latter part of his life. The film was made by Juhani Aho’s sons, Heikki and Björn, who had spent their entire childhood living next door to Sibelius. They had set up their documentary film company only two years earlier. The company papers had been prepared by G.W.<?xml:namespace prefix = o ns = "urn:schemas-microsoft-com:office:office" />Roering, an engineer who had agreed to keep an eye on the boys’ finances, and the film company Aho & Soldan had received its license on 27 August 1925. Cinematographer Heikki Aho’s imagination was fired by his father, author Juhani Aho, whose novel Juha had gained international renown with the 1921film version directed by Mauritz Stiller. Juhani Aho’s wife Venny Soldan-Brofeldt, an artist in her ownright, was also a recognized film critic, and talented cameraman Björn Soldan respected her views. Heikki Aho and Björn Soldan were the first Finnish cinematographers to spend time abroad and gain first-hand knowledge about modern trends. Soldan studied photography at the Munich Academ yof Fine Arts from 1923 to 1924 and was inspired bythe experimental spirit of the Bauhaus school. Aho, a graduate mechanical engineer, worked as an assistant to the colour theorist Wilhelm Ostwald at the German Zeiss factories from 1921 to 1923, and his education in spectacular black-and-white tones was put into practice in the Aho & Soldan films. Aho & Soldan were additionally inspired by the German film reform that raised documentary films to the status of an educational tool. In Finland too, the cultural values and great men of the motherland were to be immortalized and shown to the entire nation.Moreover, Finland’s culture and natural beauty were to be introduced to international audiences. Filmmakers Heikki Aho and Björn Soldan were ready for this. 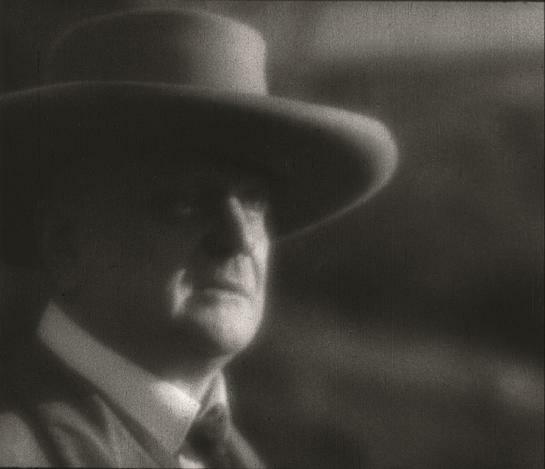 Their first real challenge was filming the portrait of Jean Sibelius, and so the unique cultural documentary Jean Sibelius at Home was made in 1927. A colony of important artists had settled in the area near Finnish national author Aleksis Kivi’s former cottage in Tuusula in southern Finland. Among these great men were Eero Järnefelt, Pekka Halonen, J.H.Erkko, E.N. Setälä and Juhani Aho. Jean Sibelius, who in 1904 moved to the Ainola villa on the road leading to Lake Tuusula, was the only internationally recognized one among them and therefore a star worth pursuing for the ambitious Aho & Soldan team. In 1923, the future subject of the films had left his creative solitude and embarked on a career as an international celebrity. Four years later, we see arelaxed cosmopolite in front of Soldan’s camera on the spring-fresh Lake Tuusula road. Even today, the image is striking: the Anglo-Saxon, casual air of the bowler hatted maestro is completely different from the later promotional pictures with the Germanic, Faustian look of the genius composer in his brimmed hat. 1985, Sibelius’s daughter Margareta Jalas recalled that the film was shot in an atmosphere that was impossible to reproduce later. It was not until 1945, near his 80th birthday, that Jean Sibelius agreed to be filmed again by a Finnish cinematographer. This time Aho & Soldan and their rival Finlandia-Kuva saw a very different Sibelius: a composer straining to live up to the image of a great man and stressed by the expectations of international fame. Sitting on his bench at Ainola and watching a flight of cranes in the autumn of 1945, Jean Sibelius became one of Finland’s cultural icons caught on film. These images in fact overshadowed the earlier film material until the composer’s death in 1957. The1927 film was only saved from being consigned to the scrap heap of history thanks to Heikki Aho’s daughter Claire Aho, who edited a memorial film for the Sibelius Society of Finland. Named after the first Sibelius documentary, JeanSibelius at Home (1961) was based on Aho & Soldan’s earliest Ainola film. Björn Soldan’s silent film camera had captured the last breaths of the maestro’s creative process at a close distance. From these extraordinary images, Claire Aho and her team progressed to the silent interiors of the artist’s home left empty by the passing away of the master composer. In this film, the flow of living memories is transmitted through Sibelius’s letters. As the camera wanders around the sitting room at Ainola, the composer’s inner monologue is heard on the soundtrack, radiating a transcendental presence into the images. The monologue fades away, the Fourth Symphony conducted by Paavo Berglund pauses, and the camera ends up looking through the sitting room window at the richness of late summer. This was the beginning of a long farewell. It was not until 2003 that Jean Sibelius was seen on the silver screen again, played by Martti Suosalo in the biographical film Sibelius directed by Timo Koivusalo". - Ilkka Kippola works as a researcher at the National Audiovisual Archives (KAVA). Excerpts from the book “JEAN SIBELIUS AND HIS WORLD” edited by Daniel M. Grimley. The music of Jean Sibelius seems richly evocative of a particular sense of time and place. Recently re-released footage of the composer directed by pioneering Finnish documentary filmmakers Heikki Aho and Björn Soldan offers a series of iconic images of the composer. Spliced together from two independent reels of film, recorded in 1927 and 1945 at the composer’s villa, Ainola, the visual images are accompanied by stirring performancesof carefully chosen extracts from Sibelius’s oeuvre—opening, of course, with the closing measures of Finlandia, conducted by Sibelius’s son-in-law, Jussi Jalas. After the brief title sequence, Sibelius appears at the piano, characteristically with a large cigar, and then at his desk, annotating a score with an unsteady hand. He is then seen in evening conversationwith his wife, Aino, after which the film shifts to Sibelius’s daily constitutional walk through the villa’s grounds, and to footage of Aino and their daughter, Margareta, in the orchard at Ainola. A more extended sequence, accompanied by the final pages of the Third Symphony, juxtaposes further footage of the composer at the piano with images of the Finnish landscape, redolent of the work of Sibelius’s friend and contemporary, the photographer I. K. Inha—a surging river cascading over rapids, mist clearing from distant hills, and the pristine waters of a lake—underpinned by the Finnish/Swedish subtitle ‘Sävelten maailmassa/I tonernas värld’ (In the world of music). The poignant final sequence returns to a profile shot of Sibelius’s daughter, Margareta, playing the violin, with the nostalgic closing pages of the Romance in F, op. 78/2: music, nature, and the domestic family home all seem organically intertwined. Such images of Sibelius as the symbolic father and progenitor of Finnish music maintain a strong hold in the popular imagination. In 1945, at the end of Finland’s ordeal during the Second World War, they must have carried a particularly urgent significance. For many listeners, Sibelius’s Finland is still associated with a particular idea of northernness: an exotic realm of icy wastes, somnolent lakes, endless spruce forests, and untouched wilderness. This problematic vision of an idealized Nordic landscape has exerted a powerful influence on Sibelius reception, pointing toward what Peter Davidson (alluding to Glenn Gould, an enthusiastic fan of Sibelius’s music) has called our “idea of north:” the land beyond the northern horizon that is “always out of reach, receding towards the polar night, which is equally the midnight dawn in the summer sky.”4 Yet this is only a very partial representation of Finland and the north itself, a poor reflection of the actual cultural contexts in which Sibelius’s work was created and first heard.